Over the years we’ve covered a lot of interesting topics over here at PhysiologicalComputing.net including the problems inherent in commercial EEG sensors [1, 2, 3], the use of biofeedback in the videogame industry [1, 2, 3. 4], the creation and development of Body Blogging [1, 2] and issues in designing physiological computing systems [1, 2, 3], to name but a few. We’ve also taken sensors out in the field and done impromptu experiments [1, 2], done a couple of interviews [1, 2] including one with Dr Alan Pope, as well run a successful CHI workshop through the website and even produced a book which we released last year! It is with a heavy heart though that we are announcing the closure of the PhysiologicalComputing.net website. As you’ve probably noticed we’ve not posted very much over the past year. We started this website in 2009, around the time I moved to Liverpool and began working for Steve at Liverpool John Moores University. We created the website so we could have a place to discuss our ideas about Physiological Computing in a more informal setting and share our interest with fellow researchers and the general public at large. Being in the same department was a great motivator for us to publish content regularly, especially in the early years. Sadly my time at John Moores came to an end and we are now working on different projects which has made it difficult to maintain the needed momentum to publish regularly and as a result we’ve decided to call it a day and close the website. 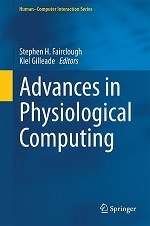 We are immensely proud of what we have achieved here on PhysiologicalComputing.net and are remiss to let it go but we both feel its time to move on to other projects. Fortunately the website will remain online and we hope you will check out our archives and enjoy reading our musings from over the years. We wish to thank our readers and everyone else who has contributed to the website, including Jen, Ute, Alex and Lenart. This entry was posted in News on February 16, 2015 by Kiel Gilleade.